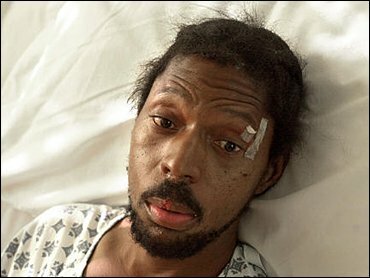 A jury awarded $9 million to a black man who suffered permanent brain damage after being beaten and dumped in a field by four white men in 2003. Billy Ray Johnson, 46, lives in a nursing home because of the injuries he suffered in the beating. In the criminal case, the men accused of assaulting him were fined and sentenced to probation and jail time, but none served more than 60 days behind bars. In a four-day civil trial in District Court that ended Friday, jurors found James Cory Hicks and Christopher Colt Amox responsible for Johnson's injuries. Defendants Dallas Chadwick Stone and John Wesley Owens previously reached confidential settlements, attorneys said. A jury of 11 whites and one black deliberated less than four hours before returning a unanimous verdict, said attorneys for the Southern Poverty Law Center, which brought the lawsuit on behalf of Johnson. "The jury told all of Texas and, indeed, the entire country, that Billy Ray is a human being who deserves to be treated with dignity — that the life of each of us, rich or poor, black or white, abled or disabled, is truly precious," said Morris Dees, founder and chief trial attorney for the Montgomery, Ala.-based law center. Authorities in this poor, pine-locked east Texas hamlet had said that Johnson, well-known around town as a friendly but "slow" character, was lured to an all-white party where underage drinkers fed him alcohol and picked on him. Authorities said Johnson, who lived with his mother and brother and had no criminal background or history of violence, was taunted for the defendants' amusement. He was found unconscious on an ant mound and had suffered a serious concussion and bleeding in the brain. Jurors in the criminal cases against Amox and Hicks acquitted them of felony charges, instead convicting them of a lesser charge and recommending probation. Stone and Owens pleaded guilty to an "injury to a disabled individual by omission" charge. District Attorney Randal Lee said before the sentences were imposed that the juries' decisions were in line with other juries who sympathize with first-time offenders. He pointed out that the so-called beating involved one punch.